Transform Your Health One Drink at a Time! The complete reference guide to incorporating plant foods into your everyday diet, Juice It! 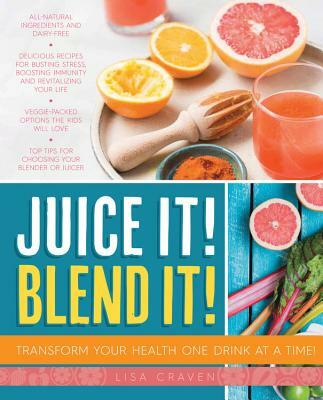 Blend It!will transform your life one drink at a time! In eight chapters, juice enthusiast Lisa Craven outlines the six Ws of juicing: who should juice, what you should put in your juice, where you should juice, when you should juice, why you should juice, and which type of juicer or blender to purchase. Lisa Craven is a juice devotee from New York City. She developed her passion for juicing eight years ago when, at a friend's apartment in New York, she decided she needed a wine-free night and instead tried a green juice. She's never looked back! Lisa is passionate about wellbeing and keeping life in balance. With over 15 years of experience in Human Resources and Talent, her career focus has always been on keeping employees healthy and well balanced at work. She is a life coach, yoga teacher and a champion for wellness in the workplace. Now resident in Sydney, Australia, she returns regularly to the US.